Is there anyone out there who can say they dislike Will Ferrell? I mean the man knows how to make people laugh. Yes, he doesn’t always get it right but even in his worst films there is still plenty to giggle about. As we discovered in Daddy’s Home on Tuesday, there is ultimately enough heart and soul within his films to make them worth a punt. He’s not a genius, granted, but he can churn out quotable lines with the best of them. Ferrell has come up with much of his best work alongside writing partner Adam McKay and, arguably, their most successful collaboration has been Anchorman. It’s the kind of film that, if you love it, you’ve seen it too many times to remember and can quote it without even thinking. It’s a truly iconic film and, after watching the disappointing Daddy’s Home, it’s exactly what I needed to remember that Ferrell can be better. It’s weird to think that back in 2004 Will Ferrell was still mostly known as the SNL alumni who primarily took the role of weird associate of other big name comedy actors. He wasn’t the main attraction that we are used to him being now. He was just the guy standing behind the likes of Ben Stiller/Vince Vaughn/Owen Wilson. In fact, it wasn’t really until Old School and Elf that he really became a notable member of the comedy fratback of middle-aged men who probably should no better but just want to make the world laugh. It was this recognition that has helped to give Ferrell the chance to showcase his own comedy writing. 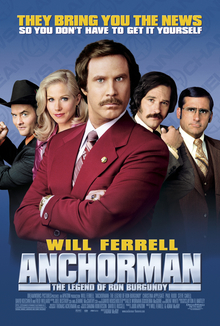 Co-written with Adam McKay, Anchorman was the 2004 runaway hit about a 1970s news anchor and his news team. Ron Burgundy (Will Ferrell) is the top anchor in San Diego and is treated like a king thanks to his star status. That is until the studio decides they need to diversify and they hire female reporter, Veronica Corningstone (Christina Applegate). She quickly makes her mark by entering into a romantic relationship with Ron before usurping his position as lead anchor. Leaving the poor man alone and with no purpose in life. I’ve already said that I love this film but I have to admit that it’s got it’s flaws. The initial concept is just a fleshed out sketch with more than a few big set pieces to keep the seconds ticking away. The film works so well because of how silly and absurd it gets but there are plenty of times during which that silliness gets a bit too much. There are moments that feel more desperate and cringey than laugh-out-loud funny. It’s understandable, of course, as it’s only the second Ferrell penned film, after 1998’s A Night at the Roxbury. It’s also completely easy to forgive because for every over-the-top scene there is plenty of inspired stupidity to giggle at. That is mainly thanks to the superb cast of comic performers that Ferrell has brought together. With stalwarts like Steve Carell, Paul Rudd, David Michael Koechner and Fred Willard by his side, Ferrell has brought together a group of people able to embrace his improvised approach. The cast all gel really well together. It just works. Obviously certain people stand out more and it’s easy to see why Steve Carell rose so quickly to be the huge star he is today. Again, it’s weird to think that he was still a relatively small name at this point and it took this film to help showcase his talents. Anchorman certainly isn’t the slickest film that Will Ferrell and co have ever produced but, especially in the wake of the disappointing sequel, it has a quality that is easy to love. Watching it again always brings about a great wave of nostalgia and is great evidence to show just how far these people have come. It’s a film I’ll always love and has inspired my biography page of this very blog. As a film it doesn’t always hit the mark but 60% of the time, it works every time.